Special departure exclusively for our group, 15 people maximum. A great voyage, we will go where few Westerners have ventured, from the Black Sea to the Caspian Sea at the discovery of 9 small republics hidden in the Caucasus mountains. From Sochi to Makhachkala over 2000 kilometers through Abkhazia, Adygea, Karachay-Cherkessia, Kabardino-Balkaria, North Ossetia and South Ossetia, Ingushetia, Chechnya and Dagestan. We will meet a dozen different ethnic groups, we will try dozens of typical dishes, we will visit artisans, musicians, scientists and simple farmers. 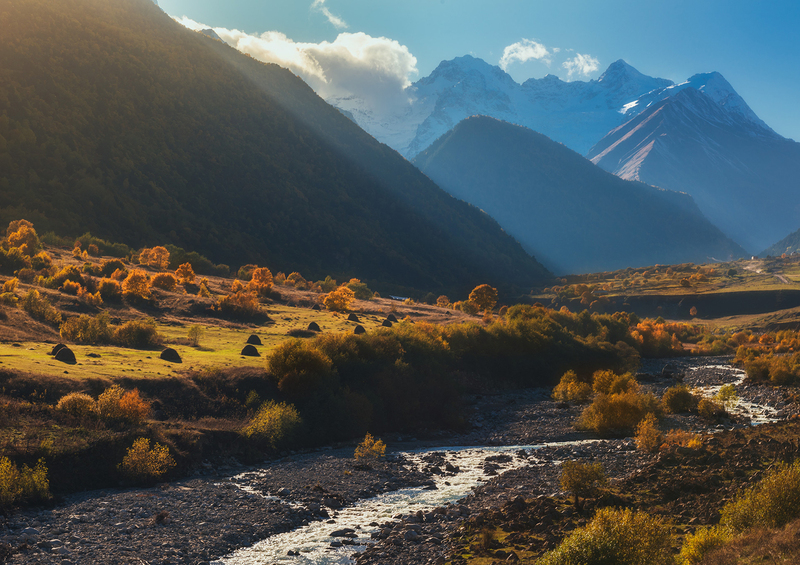 Some spectacular mountain passes, Mount Elbrus and several national parks will allow us to experience a still primordial and poorly affected by man land. At the end of this adventure we can say that we know the Caucasus! Our guide for this voyage will be Piero Bosco. 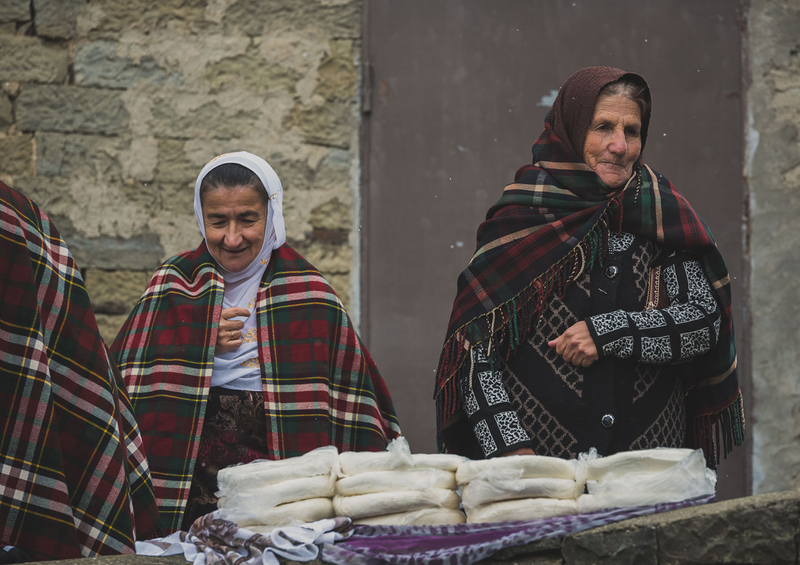 Your tour guide will meet you at Sochi Airport, and from there we’ll head to Abkhazia, a small, fragrant, and blooming republic that is cozily nestled along the coast of the Black Sea. We’ll spend the evening in Gagra, a famous resort town founded before the Russian Revolution of 1917. During the Soviet era, this was a very prestigious vacation spot. Here, we’ll have dinner and experience our first taste of the national cuisine. Full day at the discovery of the Ritsa Relict National Park hidden in the mountains of Abkhazia. We will visit the pictoresque Ritsa Lake, situated at 950 meters above the sea level within a primordial fir forest. We will also visit the Stalin’s dacia wich is on the lake shore and then go up on the alpine meadows for horseback riding, a lovely walk through the mountains, and a tasting of locally made goat cheeses. We will return to Gagra in the evening. Today we’ll travel around coastal Abkhazia to see the landmarks that it inherited from various empires. Romans, Byzantines, Ottomans, Russians, and the Soviets, all of them were mere guests in this region. While each empire did leave its mark, none were able to bend this ancient land to their will. In the morning, we’ll walk around Gagra and Pitsunda. Lunch will be be served at the village of Achandara, and then we’ll drive to New Athos, home to the ruins of the Abkhaz Kingdom’s first capital. There we will see a beautiful monastery founded by monks from the island of Athos in 1864, and one of the world’s largest karst caves. We’ll end our day’s journey at Sukhum, the capital of Abkhazia, which has managed to preserve the spirit of an old seaport town despite the devastation of the post-war years. We’ll start the day with a morning stroll around Sukhum, then visit the National Museum and Botanical Garden, before heading back towards Russia. In the evening, we’ll walk around Sochi and enjoy a sunset dinner next to the Marine Station, one of the city’s most fascinating buildings. In the morning, we’ll board the high-speed Lastochka commuter train and travel to the town of Khadyzhensk, regionally famous for its beer production. There we’ll switch to a minibus, and a couple of hours later will be at the village of Mezmay, the most out-of-the-way spot in the Krasnodar Region, located near the Lagonaki Plateau (a UNESCO heritage site). At Mezmay, we’ll trek across the canyon of the Kurdzhips River, with its picturesque waterfalls and boxwood groves that make the area look like a bewitched fairytale forest. In the evening, we’ll get to experience a genuine “black” banya, a traditional bathhouse where stones are heated indoors, emitting smoke which blackens the bath’s interior walls. Dinner will be served by one of the local families. If the meteo conditions will allow us we will board the 5 passengers helicopter at our exclusive use, about 2,5 hours flight to get the best view of the Mount Elbrus. We will also land on a spectaculafr spot in the mountain for at least one hour. Overnight at Boutique Hotel 4****. After breackfast we will be transfered to the airport in time for our flight home. Arrival at Mineralniye Vodi airport and transfer to Pyatigorsk. In the evening, we’ll conclude the trip at Nalchik. Next, we’ll drive to the ancient mountain villages of North Ossetia. We’ll ride off-roads to get across a high-elevation pass, and by evening will find ourselves in the Tsey Gorge, the sacred valley of the Ossetians. 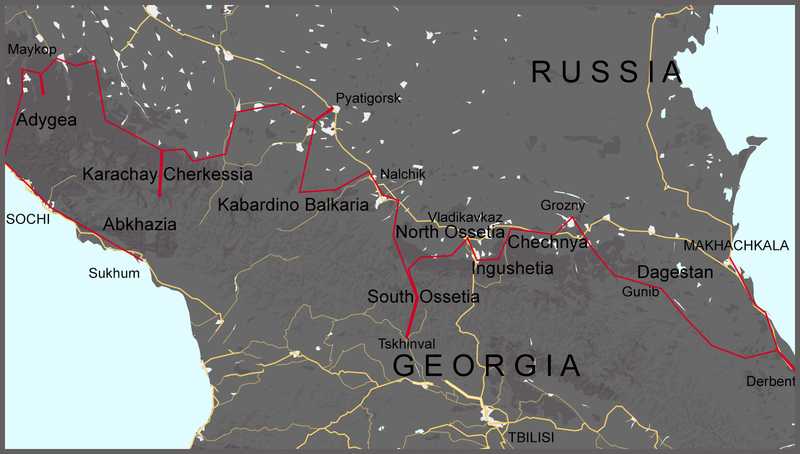 Today we’ll travel to South Ossetia, a partially recognized republic which resisted Georgian aggression from 1991 to 2008, before finally being recognized as an independent state by four UN member states: Russia, Venezuela, Nicaragua, and Nauru. Its military history, however, is far from the only reason for visiting this small country. Here we’ll find the most interesting mix of Georgian and Ossetian culture, as well as a distinctive folk faith, a syncretism of Christian Orthodoxy and pre-Christian Ossetian traditions. We will also visit the Ossetians most esteemed sacred place, Dzhery Dzuar, and afterwards stroll through the streets of the republic’s capital, Tskhinval, accompanied by a veteran of the independence war, concluding the walk with a traditional Ossetian feast. In the late evening we’ll be back at Tsey. We’ll drive through various mountain roads across almost all of historical Ossetia to see its best-known landmarks: the Rekom Sanctuary, Ursdon rock fortresses, Midagrabin Waterfalls, and the Dead City of Dargavs. In the evening we will arrive to Vladikavkaz. We’ll spend the whole day slowly exploring the city, learning to make famous Ossetian pies, and enjoying traditional Ossetian dances. In the evening, we’ll meet with Taymuraz Berozty, a young multi-instrumentalist who is rekindling the musical traditions of his land. The first half of the day is free time, and afterwards we’ll go to the market to buy fresh vegetables and fruit for a picnic, and drive to the mountains of Ingushetia. 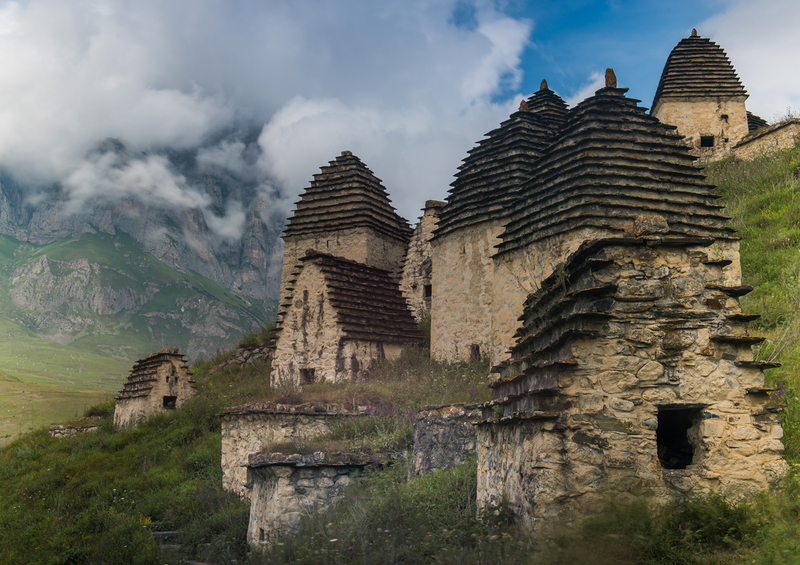 The Ingush people refer to themselves as Galgay, which roughly translates to “branches of the towers.” We’ll visit several medieval villages to see for ourselves the origins of this name. It seems that the Caucasian culture of tower building was born and reached its pinnacle right here, in these valleys. For dinner we are invited to the house of an Ingush family. This is our chance to have a delicious dinner and to learn from the hosts about their unique life in the mountain valley. In the evening we will arrive to Armkhi. We’ll spend the morning exploring the most interesting Ingush defense towers, and then drive to the flatlands of Chechnya, to visit a private open-air museum, Dondi Yurt. We’ll have lunch with the museum’s creator and take a tour of the exhibit. In the evening, we’ll go to the capital of Chechnya, Grozny, and see the skyscrapers of the newly renovated city. We’ll explore the city in the morning, visiting the Heart of Chechnya mosque, and the museum of the republic’s first president, Akhmad Kadyrov, followed by lunch in a restaurant that specializes in the national cuisine. Afterwards, we’ll drive to the mountains, to Lake Kezenoy-am, the largest body of water in the mountains of the North Caucasus. In the morning, we’ll take the off-road vehicles across an easy pass to find ourselves in the mountains of Dagestan. Today we’ll visit an ancient watermill, where locals make urbech, a Dagestani delicacy made from flax seeds or apricot pits, followed by a visit to a local manufacturing facility for burkas, traditional felt cloaks. Next, we’ll visit Akhulgo, the place of the bloodiest battle of the 19th century Caucasian war. We’ll also stop by the workshop of an Untsukul craftsman, who will introduce us to the unique craft of intricate woodwork. 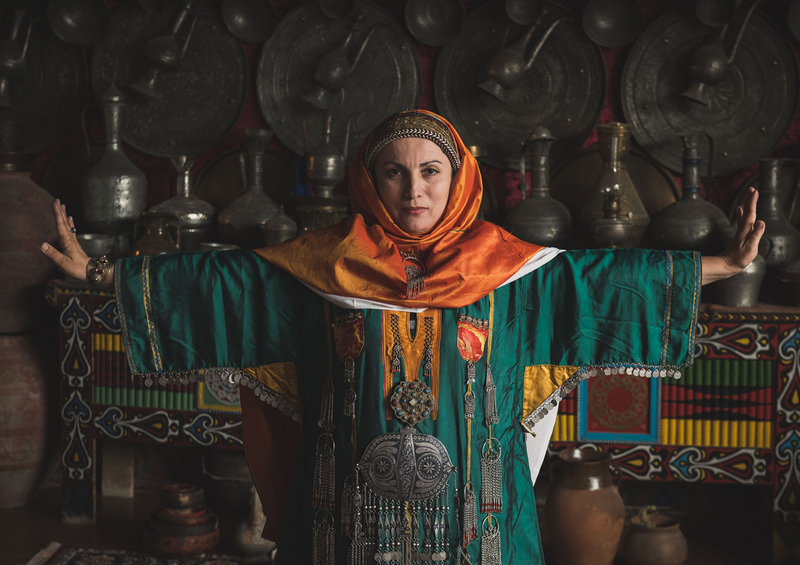 At the end of the day, we’ll find ourselves in the village of Gunib, which gained its fame through one of the most significant events of 19th century Russian history, the surrender of Imam Shamil to the Russian imperial army. In 1834, Imam Shamil headed the mountain dwellers’ fight for the establishment of Sharia law and independence from the Russian Empire. The result of this uprising was the establishment of theocracy in the region, which survived for 25 years. In 1859, Shamil’s last battle took place at the village of Gunib. In the morning, we’ll drive to the village of Chokh famous for its unique 19th century architecture. Afterwards, we’ll go to Sogratl, an ancient village which once had a reputation for its scientists and magnificent madrasah, a Quar’anic school. To this day, Sogratl’s village school is unique, many of its graduates continue their education at Russia’s best universities. We’ll visit the school, and talk to the students and teachers. If the group is physically ready, we’ll hike to the Dagestani Machu Picchu, the deserted village of Gamsutl. It offers beautiful views of the surrounding mountains and traditional Avar architecture. If the hike is not possible, we’ll have more time to explore the Andalal villages. We’ll drive back to Gunib. In the morning, we’ll bid farewell to the hospitable Avar people and drive higher into the mountains. On the way, we can visit the unique underground waterfall near the village of Salta. Take an extra pair of shoes, as the trail to the waterfalls will have us walking ankle deep in water. Granted, if the hot weather persists for too long, the waterfall may dry out, but we’ll hope for the best. By lunchtime, we’ll be in the village of Balkhar, known for its ancient ceramics production which is preserved to this day. In addition to lunch, we’ll have a short pottery workshop, so everyone will get their hands dirty! This village is home to the Lak people who are famous for their ingenuity. In the late afternoon, we’ll arrive to Kubachi, which is best known for its craftsmen. In the old days, they made stone carvings, chain mail, and sabres, and in the Soviet era the village gained fame for its goldsmiths. Kubachi residents are a small ethnic group that speaks a dialect of the Dargin language. Overnight at the house of a local goldsmith. In the morning, we’ll visit Qala-Quraysh, a deserted village, which in the Middle Ages served as the capital of the Kaytag ustmystvo (kingdom). According to legend, this state was ruled by the arabs from the Quraysh tribe, to which Prophet Mohammed also belonged. In the village one can still find a mosque and a 12th century mausoleum. Many consider Qala-Quraysh a sacred place. We’ll have lunch at Derbent, one of Russia’s southernmost and oldest cities. The last few days were filled with diverse experiences and off-road traveling, so after lunch it’s time for some rest. Happily, our hotel is just 50m from the beach! Today we’ll stroll around the narrow old streets, see the Naryn-Kala medieval fortress (UNESCO world heritage site), Russia’s oldest mosque, ancient bathhouses, and the Kyrhlyar cemetery, which, as legend has it, is the burial site for forty Sahabah, the companions of the Prophet. People of different faiths peacefully coexist at Derbent. Shia and Sunni muslims pray in the same mosque, which neighbors an Armenian temple, a Christian Orthodox church, and a synagogue. We’ll make sure to visit all of these places and speak to the local residents, so that you can see for yourself that, regardless of their nationality, the residents of Derbent are a special tribe with its own unique culture. We’ll spend another night in our beachside hotel. In the morning, we’ll drive to Makhachkala, directly to Second Marketplace, which resembles an entire city located inside the city. There you’ll find all the bounty of the Dagestani land: aged sheep cheeses, alpine herbs, honey and urbech, dried meat from the mountains, fresh fish from the Caspian Sea, and even black caviar (sold on the sly). For lunch we’ll go to an authentic Dagestani restaurant. There, we’ll learn to make khinkal, local dumplings, chudu pies and other dishes. Afterwards, we’ll visit the Museum of Traditional Dagestani Art and stroll through city streets peppered with antique and craft stores. In the evening, we’ll enjoy a farewell dinner. Transfer to the airport in time for our flight home. – All meals in the Caucasus. – Optional helicopter excursion on September 27.